POF-4 MP5 Semi-Auto 9mm Pistol Is a Real Reverse Stretch, and the Only Factory RS imported into the USA. ***Accepting Backorders Now for early 2019 Delivery***I AM PERSONALLY CHECKING & QC EACH GUN WHEN THEY COME IN MY SHOP, YOU WILL ONLY GET A GRADE "A" GUN! 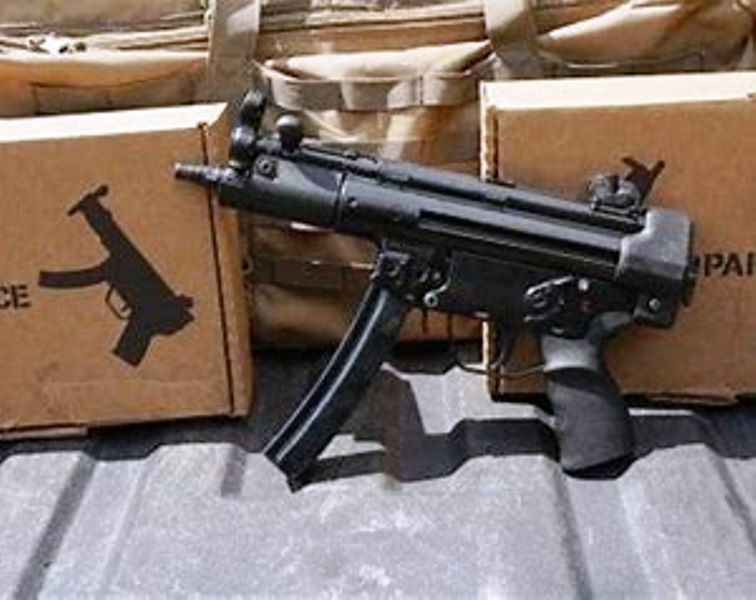 These are Real MP5's Produced UNDER LICENSE by POF on HK Licensed Machinery in Pakistan and Stamped MP5 on the Receiver.THESE COME OFF THE SAME PRODUCTION LINE AS THE SMG'S. THEY ALSO HAVE A SWING DOWN LOWER LIKE THE SMG, THE SAME GUN AS THE SMG BUT IN SEMI AUTO! Comes with 2-30rd Mags, Navy Threaded Trilug Barrel, Sling, Manual, Cleaning Kit and Thread Protector/ Dust cap. Made to the same specs as the HK MP5, and Produced UNDER LICENSE by POF on HK Licensed Machinery in Pakistan. Same Gloss Black paint as some USA Mfg's use. They are LICENSED BY HK GERMANY AND BUILT in PAKISTAN by POF,in a HK LICENSED PLANT. These are NOT copies or clones!! These POF MP5's are LICENSED BY HK GERMANY AND BUILT in PAKISTAN by POF, in a HK LICENSED PLANT. These are NOT copies or clones!!! THESE COME OFF THE SAME PRODUCTION LINE AS THE SMG'S. THEY ALSO HAVE A SWING DOWN LOWER LIKE THE SMG, THE SAME GUN AS THE SMG BUT IN SEMI AUTO! The POF- 4 is one of the most reliable & compact sub guns in production at the Pakistan Ordnance Factories. Based on the Famous H&K delayed roller locked blowback system, this 9mm gun can be employed for Close Quarter Battle (CQB) This gun is the Only real Factory Reverse Stretch Imported into America.These are Real MP5's Produced UNDER LICENSE by POF on HK Licensed Machinery in Pakistan and Stamped MP5 on the Receiver. I AM PERSONALLY CHECKING & QC EACH GUN WHEN THEY COME IN MY SHOP, YOU WILL ONLY GET A GRADE "A" GUN!